Garry Robertson DJs create memories that will be remembered for a lifetime! Your wedding day will be the most important social event of your life. You know that’s true, and so do we! 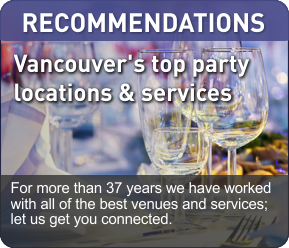 Our team of Wedding Planners and Vancouver Wedding DJs have been creating memories for families since our first party in 1974. From your first steps down the aisle, right through to your last dance, you will feel confident knowing that every moment of your wedding will be highlighted with just the right music, at exactly the right time. 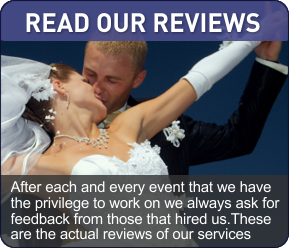 Garry Robertson professional DJs have the knowledge and experience to ensure your wedding is the “Wedding of the year!” … with no unwanted surprises. 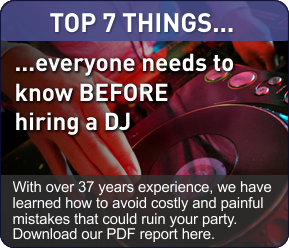 Not only do we play great dance music, Our DJs incorporate our proven 3 steep process to guarantee a packed dance floor from your very first open dance. We know how to get your guests up onto the dance floor and keep your wedding flowing smoothly all night. Consider how important the timing of your entrance music is, or the style and volume of your cocktail and dinner music. The timing and introduction of your first dance has to be right! Also, there needs to be hours of non-stop dance music and fun interaction to keep you and your guests having a great time, all night long. We specialize in all of this and more, we know what we are doing, and we are very good. That is why you are here – you’re looking for us – A team of professional entertainers that will do what you want! Want something special for your wedding? We will spend the time with you at our office to discover just how we can make your wedding special and unique – just like you. From special Dance lighting, fun interactions, photobooth, LED Dance floors to dancing on a cloud, Garry Robertson DJ Entertainment will deliver a night of amazing fun!